Labor & Wages Speed Dating Economics Lesson! Fast paced discussions. Compelling prompts. Multiple partners. Critical thinking. That’s the power of speed dating. 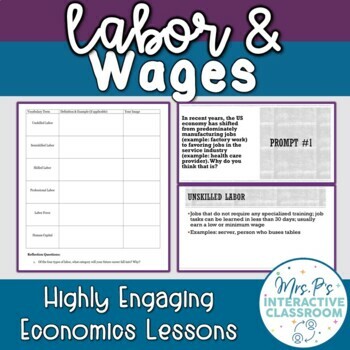 Disguising critical thinking about labor, wages, and the role of technology in our economy as a fun, highly engaging activity makes this one of the most awesome lessons of the year. And guess what? It’s so low prep, you just have to do the printing (and maybe hang up a few vocab terms) ahead of time. This lesson focuses on wages, types of labor, human capital, outsourcing, technology, and shifts in the American economy. It asks students to tie wages back to what they already learned in their supply & demand unit (it’s assumed they already know the basics of supply & demand). Students will discuss with a partner for a few minutes, record the highlights of their discussion on a provided worksheet, and then move on to the next prompt and partner. There are 8 total prompts.